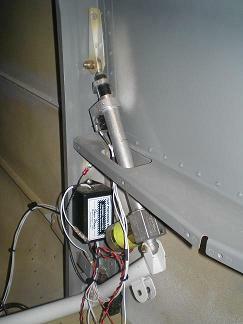 I installed Vans Flap System in my RV-8 to control the flap motor. It lets me hit the switch to move the flaps to the desired position instead of having to hold the switch down the entire time. 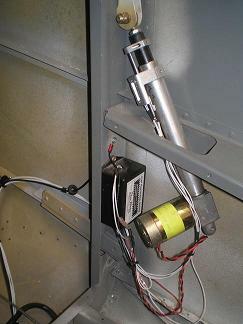 The tips here will be useful to other RV builders and others installing electric flaps. I initially fit the flap motor without the wings on. I had just the WD-806 Flap Actuator Weldment installed. This let me move the motor full length up and down. Later, after the wings and flaps were installed, I only had to adjust the up and down stops. It took me a while to get the hole in the F-860C-L aft arm rest the right size and shape to allow the motor arm to move through without scraping the edge. I hooked the motor up to a trickle charger to run it up and down. Normally I advise against using a trickle charger, but I figured that since it was just the motor, and no electronics involved, it wouldn’t hurt. A spare battery or power supply would be better, but I didn’t have one, so I used the charger. I don’t know how long you can run the motor without it overheating, so I went slowly. I ran it up or down until I could tell it was going to scrape, then I stopped. I had to pull the motor out, and grind more off of the F-806C-L. I figured the time I spent grinding, filing and smoothing allowed the motor to cool. I located the electric control for the flap system sensor on the forward side of the F-807 bulkhead, where it will be covered by the F-876PP-L aft cabin cover. Two screws and locknuts hold it in place. In the older kits, we had to drill the holes in the floor for the bottom of the F-876 aft cabin covers. I wanted to ensure there would be no interference with the flap motor as it traveled full up and down. So I taped a piece of 1/8” thick aluminum to the farthest inboard spot on the motor. Then I set the F-876-L into position and clecoed the top holes. I could then push the bottom of the F-876-L in or out as required until there was no interference with the motor. Then when I removed the 1/8” spacer, I knew I had at least that much clearance between the motor and the F-876-L. It looks like the new, match drilled kits have the holes in the floors already drilled. Before you install the platenuts, you should check to ensure your motor clears the F-876-L. It would be easy to move the holes a little if required. I ran the wires under the floor, through the F-807 bulkhead, then under the baggage compartment and back forward through the F-807 bulkhead. I cut a slot in the F-834B-L baggage floor so I can slide a rubber grommet in place to keep the wire from chaffing. I suppose the wire could be run up through the floor underneath the flap system motor, and the same kind of slot and grommet used when the floor is installed.